He’s a renowned economist who developed a unique forecasting model with a track record of superb accuracy. Hundreds of business leaders file into the Segerstrom Center for the Arts each year for his presentation at the Chapman University Economic Forecast Conference. They hang on his every word about the economy, eager for the information they need to plan and invest. So what’s the surprising question people like to ask Chapman University President Emeritus Jim Doti, Ph.D, after he delivers the forecast? A clue – it has nothing to do with the economy. “People say, ‘How do you do that without notes?’’ Doti says. His eyes light up when he answers. “I love it because I’m teaching. When you’re teaching you don’t need notes because it goes from one idea to the other,” he says, explaining his unscripted talks that dive deep into economics but remain accessible to even the newcomers in the audience. This 2018 forecast marked the 40th anniversary of what is at its heart an unmatched classroom experience. More than 1,000 attended this year’s conference. Doti offered his regional and national forecasts for 2018 and weighed in on related issues, from NAFTA to Capitol Hill’s tax debate. All of it punctuated with mini-lessons in economics and whimsical photos to occasionally illustrate a point. Not bad for something that started as a class project. In 1977, few economists gave much thought to Orange County’s economy. But Doti, a young economics professor at then-Chapman College, saw it as a laboratory for econometrics, a branch of economics that uses statistics, economic history, patterns and other data to forecast trends. Rather than developing a textbook study, Doti challenged his students to put together data reports and plug the numbers into his forecast model. 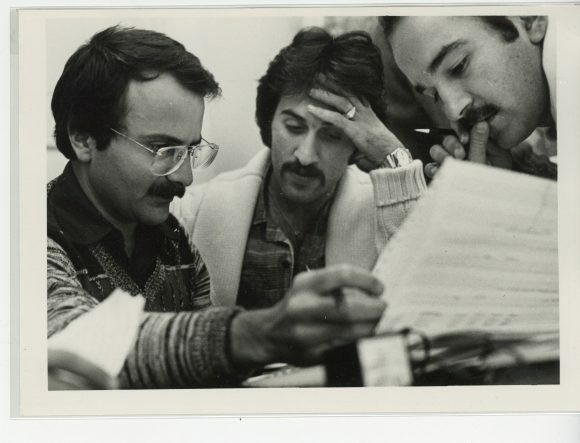 At left, then-Professor Jim Doti and graduate students Shahram Mehran, center, and Reza Alavi, crunch the numbers for an early economic forecast. The team had some access to mainframe computers at Cal State Fullerton, but most of the computing played out over long, pizza-fueled nights with 10-key adding machines and hand-held calculators. At Wednesday’s forecast, Doti even pulled from his pocket the same Texas Instruments calculator he used then and still keeps at hand. Behzad Binesh, now Chapman’s vice president of finance and University controller, was one of those students and remembers those sessions fondly. “It was exciting to see the model work. We loved it,” Binesh says. Housing was a key sector they evaluated in those early data reports. 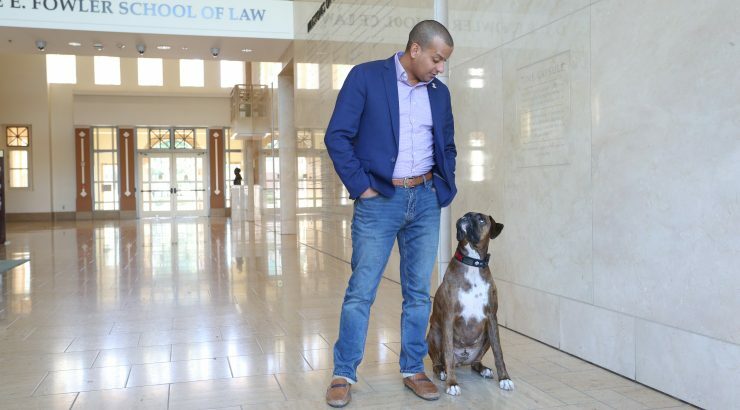 So when the Proposition 13 debate seized the public conversation, Doti and his students, which included the late Professor Essie Adibi, were primed with data. 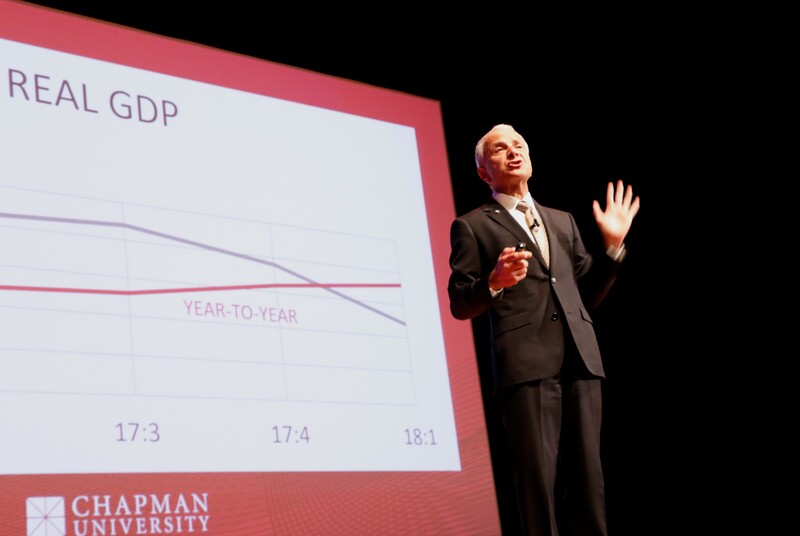 He proposed the idea of an economic forecast to then-Chapman President Buck Smith. Banks and other universities were doing national and state forecasts, but no one was doing an Orange County forecast. Doti had frequently given informal talks on economic trends to business leaders as he accompanied Buck on his fundraising efforts. But this would be more formal. Buck said yes, and the first official forecast was held at the Fluor corporate offices, thanks to Trustee Bob Fluor. Today the forecast and its partner Forecast Update held each June are among several signature events and research reports presented by Chapman’s A. Gary Anderson Center for Economic Research. Between 2004 and 2016, Chapman’s forecast accuracy for real GDP ranked No. 1 when compared to forecasts issued by the organizations participating in the Blue Chip Economic Indicators surveys. Generations of graduate and undergraduate students have contributed to the efforts, learning first-hand the importance of economic forecasting to folks working everywhere from Main Street to Wall Street. The forecast’s mission has grown, too. What began as a classroom project now serves the community, business people and investors on local and national levels. “The reports we are producing and the forecasts we are producing help people in their decisionmaking,” he says. Thanks to major sponsors and attendees’ registration, the event also serves as a fundraiser and has raised more than $2 million for student scholarships. And for Doti, back in the classroom again, it is still a teachable moment. 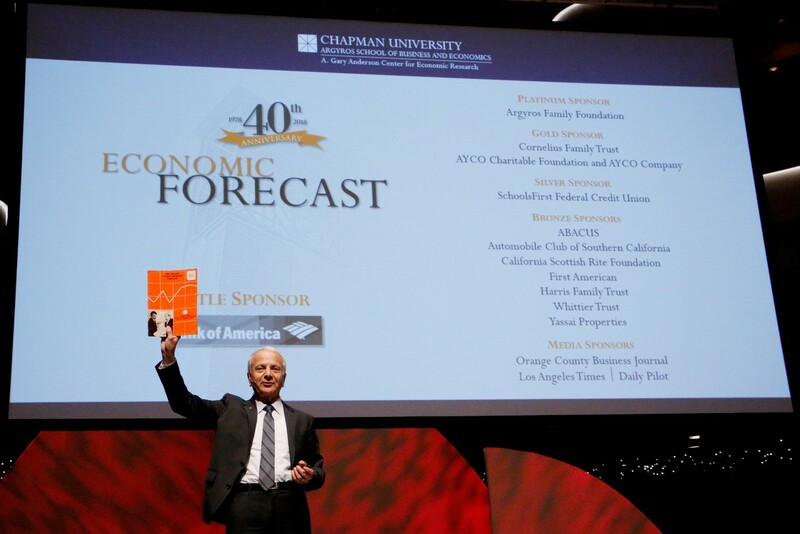 Display image at top/President Emeritus Jim Doti opens the 40th annual Economic Forecast with the first forecast brochure in hand. 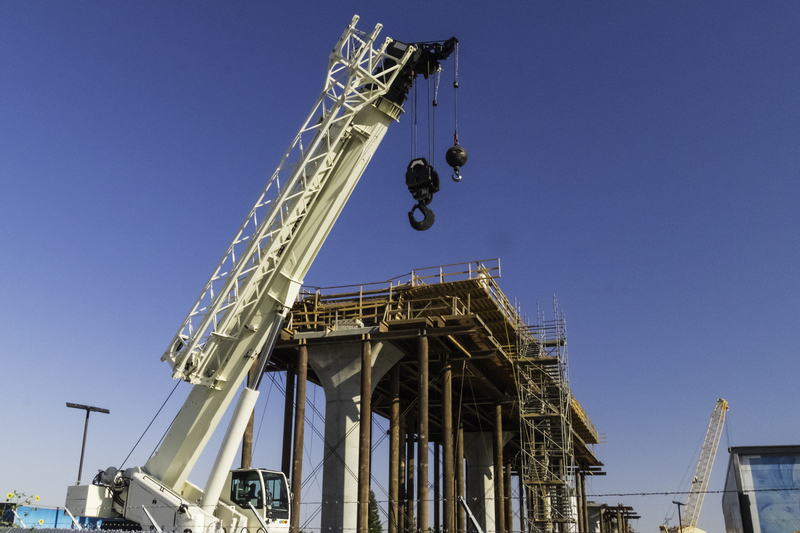 The decision to curtail California’s high-speed rail plan reflects the disfavor residents already felt for the $77 billion project, says a Chapman University professor.